The pictures in this page are pictures I have taken in a trip to Great Britain. All pictures have been scanned at low resolution using a simple scanner, so their quality may be less than satisfactory. Of course, I reserve all rights to the pictures appearing in these pages. 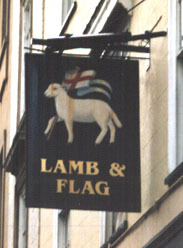 The above sign, the "LAMB & FLAG", is the sign of a pub in St Giles street, Oxford (see the pub's homepage!). I think this sign (not the pub) summarizes my trip, in which lambs (or more generally, green pastures and livestock) and English heritage have been a big part of.